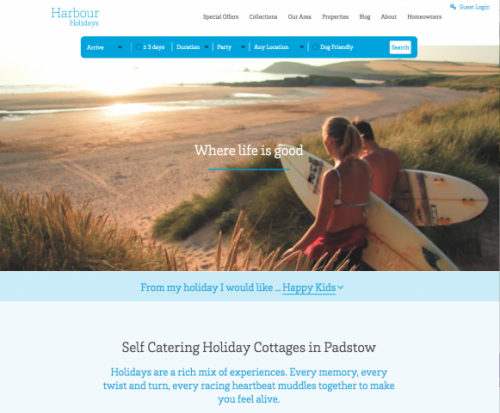 Harbour Holidays launches its new website with a fresh new look and added functionality to help holidaymakers in their choice of holiday accommodation in and around Padstow in Cornwall. Padstow cottage holiday specialist Harbour Holidays has launched a new website to showcase the wide range of holiday properties it has available to hire in the Padstow area of North Cornwall. The new website – harbourholidays.co.uk – has been completely rebuilt and includes the latest design features and functionality to help holidaymakers research and book their ideal holiday properties with ease. With the addition of calendar availability search and online booking, the new site delivers essential features it needs to compete with larger, national cottage companies and online travel agents. Response to the new website has been positive, with some customers commenting that the new look and simplicity of the website encouraged them to book with Harbour Holidays. The Padstow based company represents cottage and holiday home owners in Padstow and nearby villages including Trevone, Harlyn, Constantine, Rock and Port Issac. The Harbour Holidays collection includes a variety of property types and styles to suit all budgets, featuring everything from small harbourside apartments to large, luxury countryside retreats. The new website was designed and developed by leading Cornish design agency Venn Creative. It utilises the latest standards of responsive design, offering great performance across different devices, from desktop to tablets to mobile phone.